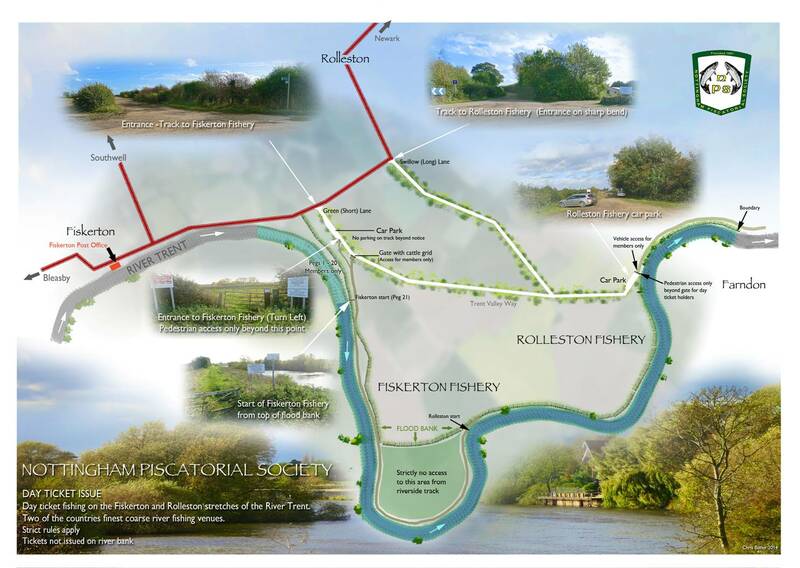 There are over 2 miles of excellent coarse fishing available to visiting anglers on the navigable section of the River Trent at our Fiskerton and Rolleston fisheries. These fisheries are home to specimen barbel, chub, pike and carp as well as roach, perch and dace. The day ticket angler will find a range of swims which suits all methods, from the stick float to the heavy swimfeeder. Although there is always boat traffic in summer, on winter days the angler can enjoy peace and quiet disturbed only by the call of the kingfishers who live along the banks. The map below shows what you can expect, and how to reach the fishery. The nearest day ticket outlet is at Fiskerton Post Office. Please note: DAY TICKETS MUST BE PURCHASED IN ADVANCE. They are NOT available on the bank. Each day ticket costs £6 and allows you to use 2 rods. There is a maximum of 2 rods allowed. View the list of venues where you can purchase your day tickets. We welcome responsible anglers to our waters. We expect them to observe the same rules as our members. We employ full-time bailiffs who regularly patrol all our waters. No keep nets. Specimen fish, especially barbel, should be properly rested in the water to allow them to recover fully before being released. No litter. The permit holder will be held responsible for the collection and taking away of all litter from their peg. Particular attention should be paid to the collection of plastic containers and nylon. The permit holder will be held responsible for all DAMAGE incurred to property or amenities during the time they occupy the fishery. The day ticket permit must be carried at all times. All anglers must also be in possession of a current Environment Agency rod licence. No dogs, radios, fires, tents or firearms. Unhooking mats must be used when specimen fishing. Adhere strictly to the parking instructions. Access to the river should be made by recognised footpaths only. Crossing of fields is NOT allowed even if there appears to be a path in the field. Cars should be parked in such a manner as not to interfere with any farm vehicles along any lane, and should not be parked in front of gates. NO VEHICLE SHOULD BE TAKEN OVER ANY LAND. No tree cutting or digging out of banks. Try to fish with at least one other angler, rather than on your own. If one gets into difficulty then another can help (if safe to do so) or raise the alarm. If you do fish alone, then consider wearing a lifejacket (ideally self-inflating) and/or utilising a dog spike and rope. You can either tie yourself to this or use it to assist in climbing up steep banks. This guideline is particularly applicable in poor weather, flood conditions, winter and during dusk or darkness. If you do use a lifejacket then ensure that it is at least compliant with BS EN 393 and that it is maintained in accordance with the manufacturer's instructions. Let someone know where you are going to fish and always advise of your estimated arrival time back home. Ensure that you are wearing appropriate clothing and footwear to keep you warm and dry. Wear a hat in cold weather. If you are wading then it is advisable to use a wading stick or a bank stick to check where it is safe to go. Do not wear waders in winter or whenever the banks are slippery. Carry appropriate equipment: a fully charged mobile phone in case you get into difficulties, a whistle to attract attention, a torch. Before fishing ensure that you have identified places to land and return fish, to ensure both your own and the fish's safety. Do not expose yourself to unnecessary risks, e.g. if a fish is snagged near to the bank it is better to cut the fish loose rather than try a risky action to land it. Take the weather forecast and river conditions into account. Ideally you should carry a small first aid kit (containing at least some plaster, antiseptic cream/spray and pain killing tablets). Consider also carrying a space blanket. These are very small and light but are ideal to keep warm a person who is suffering from hypothermia. They can be purchased from a chemist. In the case of hypothermia keep the victim out of the wind and cuddle (yes, cuddle!!) them until help arrives. Layout your tackle so you know where it is. Weil's Disease (Leptospirosis) is a real threat around water and can be contracted through the smallest area of broken skin. Either wear gloves or, if you cut yourself when fishing, cover the wound with a plaster. It is dangerous to fish with carbon rods or poles within reach of overhead powerlines. Maintain a safe distance and do not carry assembled rods or poles under these power lines. Never fish in a thunderstorm - lightning kills. Take shelter (not under a tree), lying flat if needs be, and ensure that carbon fibre and metal items are not near you. Ideally you should be able to swim and to be able to swim fully clothed. See your local swimming baths for courses. Never give or take alcohol during an incident or when winter fishing. Watch out for undermined or silt-covered banks. Whatever the provocation, do not be drawn into conflict with boat or canoe users. Back off and report any unsavoury incidents.